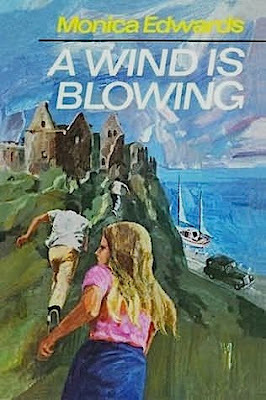 Bookride: A Wind is Blowing. Monica Edwards, 1969. Monica Edwards. A WIND IS BLOWING. Collins, London 1969. Probably the most difficult Monica Edwards book and, as often happens, her last book. Slightly more adult than most of her Romney Marsh (East Sussex) pony books, it features only Tamzin and Meryon as characters and not Rissa and Roger. Her children, unlike Enid Blyton, do not stay the same age but grow almost to adulthood. The German edition 'Solange der Wind weht' (1973) shows a very cool couple of late teenagers in trendy 60s fashions and seems odd against the usual Punchbowl Farm and Romney Marsh books. I am indebted to the the definitive Monica Edwards site for this image. VALUE? Values of popular children's books like this are something of a minefield. The true first is always going to be scarce but the book could easily be reprinted by 'Girls Gone By' or the Edwards estate and most people just want to read the books. 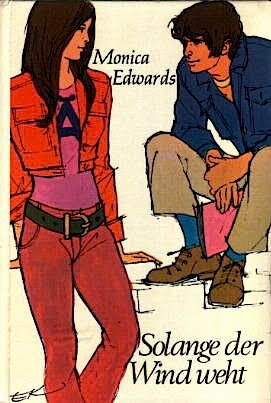 A reprint would deflate the price by quite a bit, this has happened with other Edwards titles and notably the Elinor Brent-Dyer Chalet School books. There are no copies of this book currently available on the web and it is much sought after - there are 57 wants for it at Abebooks.com alone. In July 2004 a reasonable jacketed copy sold on ebay at £235. I am told it has made hefty sums there a few times. Another late Romney Marsh title 'The Wild One' (1967) sometimes regarded as the second rarest of her books is listed at £250 to £300, so logically 'Wind' should be more. When in doubt extrapolate!